Studies have shown that diet is very important to gum health. But first, here is the run down on what most people don’t know about their oral health. Gum disease is the #1 cause of tooth loss. 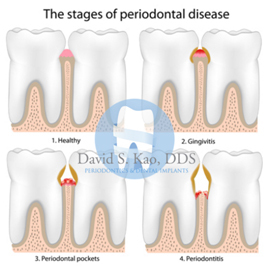 Periodontitis is the second stage of gum disease and is difficult to treat. Sore and bleeding gums may be an early indication of periodontal disease and should be taken care of right away. Periodontitis is when the gum disease has been left untreated as gingivitis and has become more severe. Periodontitis can lead to bone loss under teeth as well as teeth themselves. Treatments are often required by a trained periodontist. A visit to your dentist is the first step. Adding certain foods to your diet also can help speed the healing process and improve the health of your gums. Continuing to eat these foods after your gums heal may help prevent future mouth problems as well. Get all your vitamin intakes, especially vitamin C.
Vitamin C helps encourage healing and maintenance of healthy gum tissues. Your gums can become inflamed and begin to bleed if you are deficient of this vitamin. Oranges are a top source of vitamin C and adding one a day will help provide enough of this essential vitamin to heal your gums.